Euriska brings to you Appurv Gupta live in Pune! 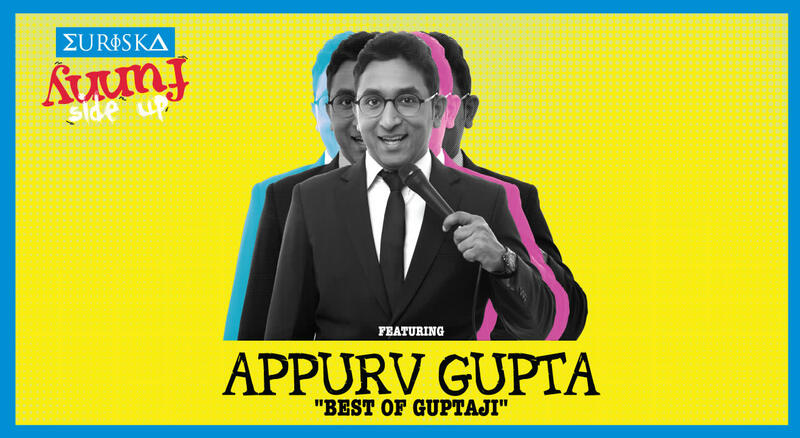 Lovingly known as Gupta-ji across the circuit and his fans, the man of wit and humour will descend at Euriska to entertain you like no one else can! Get your friends along, have some good food as well as drinks, and enjoy this weekday specialty! Comedy is not everybody’s cup of tea and it takes a very creative mind to perform stand-up. The Indian stand-up comedian Appurv Gupta biography is such a story. He went from being an engineer to a comedian and that was no easy task. He is one of the most recognized Indian male comedians that are celebrated for their fresh content. He is very active on Twitter and keeps on posting funny quips. He is among the top 20 Indian stand-up comedians and one of the front-runners in the batch of ‘Hinglish’ comedians and his story will possibly serve as an ideal tale of hope for young aspiring comedians who are weighing their options to enter the market. Appurv gives you his views on flights and plights! Euriska is an epicurean journey through the Mediterranean and Greece especially created for you. Discover new flavours and develop your palate with fresh, exotic ingredients and surprise yourself with new concepts in dining. The Euriska Island bar caters to every taste with a choice of the leading spirits from around the world. Adaptations and originals, award winning cocktails created by the world's leading bartenders are mixed, shaken and stirred using only the most authentic ingredients. Experiment or stick to your favourite, either way its Euriska!